The question is simple, can pumpkins cross pollinate with gourds? And does it matter? The answer is yes and no. And it does matter. If you plant pumpkins in close proximity to gourds, such as in the same garden or if you grow pumpkins and your neighbor grows gourds and they are flowering at the same time, you have the potential for cross pollination happening with your fruits. Of course just because two different varieties are close enough for cross pollination it doesn’t mean they will, of course if cross pollination does occur you may not know until years down the line. Let’s look at the basics. Pollination is the process by which pollen is transferred from a male flower to pollinate a female flower. This is how a pumpkin or gourd fruit is formed and with growth and tending the plant you can produce full sized, mature fruit. Pollination usually occurs naturally and is carried out by insects, typically bees, which travel from flower to flower. Cross pollination happens when bees carry pollen from one plant to another. Cross pollination is a natural process and a healthy one for ensuring genetic diversity when occurring between different plants of the same variety. Cross pollination can occur however, between plants of different varieties resulting in very different looking fruits (in the next generation) that can be quite desirable or not. When pollination occurs not only does fruit grow but also seeds are produced (unless the fruit is a seedless variety, genetically modified, or some abnormality is occurring), and in the seeds reside the genetics of the pollination. These may carry healthy true to type genetics if pollination occurred naturally between plants of a single variety or may carry non-true to type genetics of a cross pollination that occurred between plants of two different varieties. This basically means, assuming the seed you plant with this year is true to type then regardless of cross pollination occurring the fruit produced will look normal and what you would expect but if a cross did occur and you planted the seeds next year you would find out by the appearance of the fruit. Of course if you don’t save seed but buy it each year you should have nothing to worry about. Now that we have established that cross pollination can occur between pumpkins and gourds, let’s address why it cannot happen. Now, while cross pollination between pumpkins and gourds can occur, it can only occur conditionally, when the pumpkin and gourd varieties are closely enough related. Orange field pumpkins, which are very prevalent in the USA during the Autumn months are members of the Cucurbita genus and C. Pepo species which also includes miniature gourd varieties such as Jack B Little, Crown of Thorns, and multi-colored ornamental gourd varieties. Since these varieties belong to the same botanical species, they can freely cross pollinate resulting in non-true to type seed. Now larger hard shell gourds (the type that can be dried out to make bowls, crafts and birdhouse) includes Speckled swan and Bushel varieties, belong to the Lagenaria genus and L. Siceria species and between themselves can cross pollinate but cannot cross pollinate with any variety belonging to the C. Pepo species. The same is true for other gourd varieties which belong to different genus and species groups and so they would not cross with the L. Siceraria gourds or the C. Pepo pumpkins/miniature gourds. 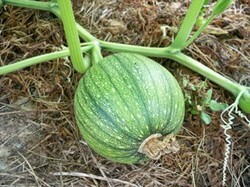 Other gourd varieties include: Wax gourds (Genus-Benincasa, Species-B. Hispida), Luffa gourds (Genus-Luffa, Species: L. Cylindrica), and Ridge gourds (Genus: Luffa, Species: L. Acutangula). So while, pumpkins and miniature gourds belong to the same genus and species groups the varieties can cross pollinate with one another if grown in close proximity and flowering at the same time. However, since pumpkins/miniature gourds belong to a different genus group than hard shell and other gourds types, the two could not possibly cross pollinate even when grown next to one another. Bodnar, Jody, Fresh and Ethnic Vegtables Specialist/OMAF (1987). Pollination of Vine Crops. Agdex#: 256/26. Ontario Ministry of Agriculture, Food and Rural Affairs. Pumpkin vines require a lot of ongoing care to ensure that you’ll have matured, full size fruits at harvest, and so it’s a must plants have enough nutrients and fertilizer.